Decorating Divas care about every area of their home looking good, and when hosting a dinner (whether informal, formal, or a holiday meal) you really want your table to look extra special. Here, we take a look at the proper way to lay your table and how to work decorations into the scheme. A formally set dinner table should be covered with a tablecloth. This is traditionally white, but whatever color you choose for your tablecloth, pay attention to how the color coordinates with the runner, placemats, and napkins. A table runner isn't a necessity, but adds a nice designer touch. Placemats may be unnecessary if you use a tablecloth, and that is entirely acceptable. Now, let's learn about dinner table place settings - how to use, and where to place them. Formal dinner table place settings can seem overwhelming, so it's your decision about how to use these rules. The overall effect should create a nice welcoming atmosphere so your guests can enjoy the meal. Most of these rules have logistics at their heart, so if a water glass has to be placed in a certain way, it's probably because it positions the glass in an easy-to-reach location. 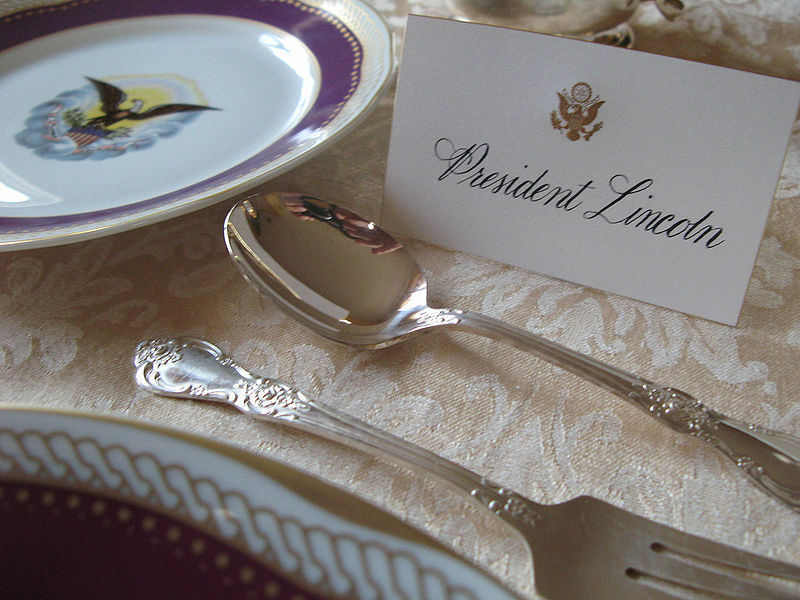 Guests can still hold their cutlery, but avoid leaning over other guests to get to what they want. 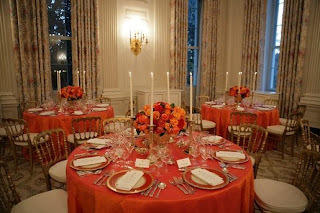 The dinner table place settings pictured are from a White House dinner. However, most of us don't own that much cutlery, and unless you are expecting the Queen for dinner, it's not really necessary. It's all about setting an elegant table according to the occasion. 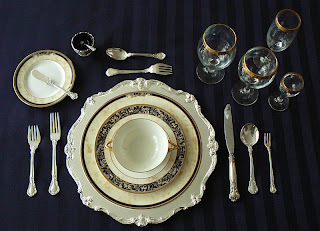 Crockery starts with a service plate, from which everything else is placed around, or on. This is usually removed when the first course is served, unless you are serving soup, in which case the soup bowl can be placed on top of the service plate. A small bread and butter plate or side plate should be placed to the upper left corner of the service plate. Cutlery usually causes the most confusion when setting or eating at a formal dinner table (remember the movie Pretty Woman? ), but is the easiest to remember. Its placement depends on the type of food you are serving. The general rule is to work from the outside in, according to the courses you are serving, with forks on the left, and knives and soup spoons on the right. The butter knife is placed on top of the bread and butter plate. Desert cutlery is usually placed above the service plate and consists of a desert spoon and cake fork. Napkins are folded simply and placed either in the middle of the serving plate, or to the outer left of each setting. Glasses should always be placed to the top right corner of the service plate; the type of glass depends on what kind of drinks are served. The water glass should be placed above the innermost knife, with the wine glasses to the right of it. A red wine glass is larger than a white wine glass, and champagne should be poured into a narrow fluted glass. Finishing touches are important to any decorating scheme, and there are no hard and fast rules for their usage on the dinner table. A decorative centerpiece should be featured on the dinner table, and can be anything: flowers, candles, battery operated fairy lights in a vase, or frosted fruits. The only rule is to keep it low in height if it will stay on the table throughout the meal, so people can conduct a conversation without peering around foliage. If you have a more dramatic centerpiece in mind, then consider removing it from the table before the meal begins. A water pitcher should be kept in the center of the table, as well as any condiments your guests may need to accompany their meal. Depending on the formality of the occasion, a named place card for each guest might save any pre-dinner awkwardness about who sits where. The placement of this should be above the desert cutlery. Whether you're hosting a holiday dinner for family, or a special dinner for friends, learning about dinner table place settings, and how to use them properly, should leave everyone with that feeling of both 'wow' and comfort.